Despite this being my favourite anime of this season, I've decided to do batch posts about it in order to be able to fully enjoy the episodes. (Otherwise, I'd constantly be looking at the screens for caps and thinking about what to say.) Besides, the story-telling is a little slower and sometimes repeated, anyway. This set of episodes provided more insight to Natsume's past and less about Reiko's - in particular, it contrasted how Reiko never really "grew up", since similar events happened with Natsume but he was able to move on and find happiness. Ep02 catalogued his current fidgety friendship with Tanuma, and how both sides worried about becoming a burden to the other, while showing a little bit about Reiko's past days. 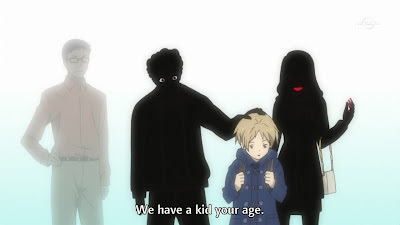 The real information came from the next two episodes, however, which showed that Natsume had the ability to move passed his similar awful childhood memories and begin seeing each human and spirit individually, instead of as collectives. 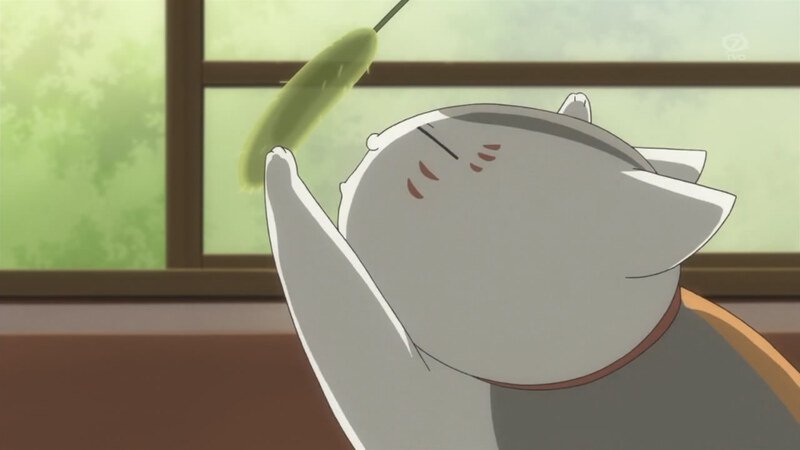 Ep02 began with Natsume and Nyanko-sensei walking home with food, but then interrupting a gathering of the local spirits. This episode was clearly going to be about Tanuma, Natsume's friend (who is also able to sense spirits, only to a much lesser degree). The local priest (Tanuma's father) hadn't been around for some time, so the local spirits rejoiced that perhaps he had left (or died, morbidly speaking). To be fair, this wasn't really maliciousness on their part; the priest's prayers had the power to "exorcise" them, which was very difficult. At any rate, Natsume eventually asked Tanuma about his father, who turned out to be away for a conference of sorts. That must be a strange village to live in. The spirit being spoken about this week was one that had wandered over from the other-worldly place of Ukihara Village. During an old shrine dance, the door between the worlds had opened and he had wandered over with his sister, becoming stuck. 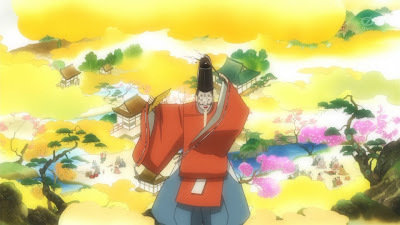 His sister died almost instantly, leading to a "twist" in the story when it turned out that the demon hunting Natsume throughout the episode (and also killing lesser demons nearby) was actually a criminal banished from the village, who was attempting to go back. In the end, the gate to the other village opened when the good spirit bled around the area of the shrine dance location, and the evil demon was taken care of by the gate's guardian. 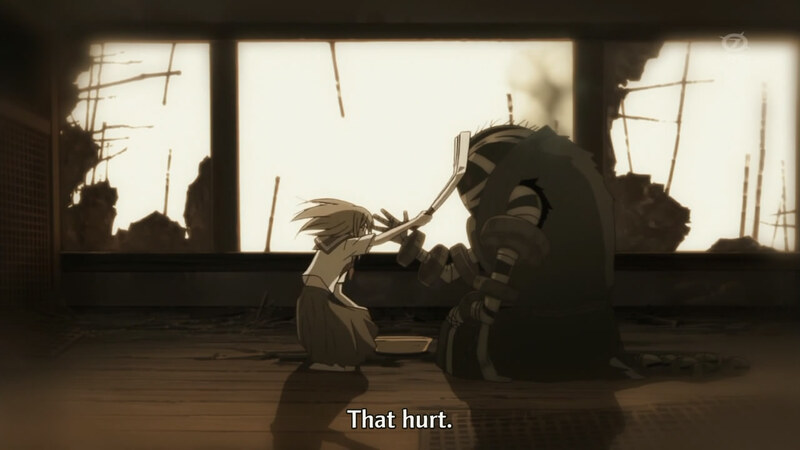 I wonder how much it could possibly hurt. The memory of Reiko with the spirit was pretty funny; he lost at rock-paper-scissors! I felt pangs of sadness throughout the episode, so the thought that Reiko was unable to see the village or that the spirit would die shortly after his return to the village (due to his rusting body) didn't burden me that much. The theme of loneliness was very prevalent in this episode, with Tanuma feeling slightly saddened at being lonely in the shrine. I do wish that they had taken the opportunity to have Natsume and Tanuma strengthen their friendship; Natsume went searching in the old shrine's grounds in order to get the demon that had been eating lesser demons nearby (to protect Tanuma), while Tanuma had left the shrine in order to not lead the spirit (which he thought was out to hurt Natsume) to his "prey". In the end, quick and easy friendship that's often shown in anime is slightly unrealistic; real friendships take much longer to cultivate and are much more fraught with hesitation. The consensus is that he's the ugliest cat ever. 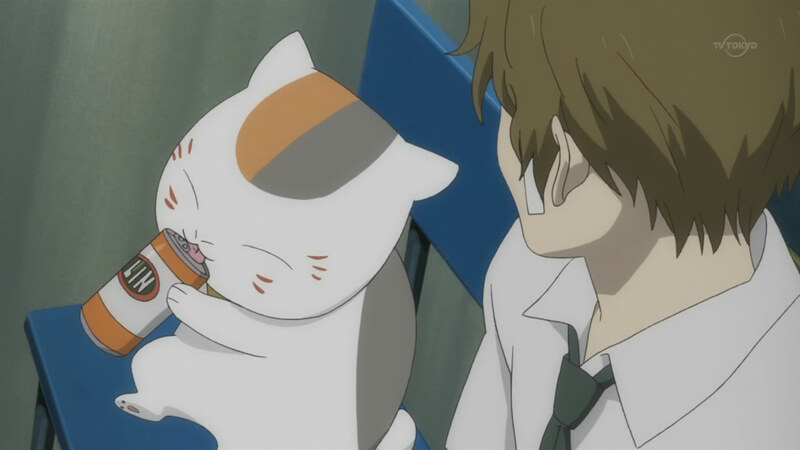 Ep03 had absolutely nothing to do with the Book of Friends; rather, it was about a childhood "friend" of Natsume's. This episode made me feel sad and very nostalgic; there are very few people who have had perfectly pristine childhoods, and episodes like this bring up many different memories. Anyway, the episode began with Natsume being asked to bring home a few slices of strawberry shortcake, since it was Shigeru's (his male guardian) birthday. After he asked a female classmate where to get cake (who even drew him a map), two male classmates of his came along because it was too embarrassing for a guy to go to a place called Forest of Cuteness by himself. Shibata showed up suddenly, commenting cryptically that it was great that Natsume had made friends (to which his classmates took great offence, sticking up for Natsume, so it makes me think that they are becoming friends), and then taking Natsume off with him to "talk". Why is he not freaked out? I'd be freaked out. 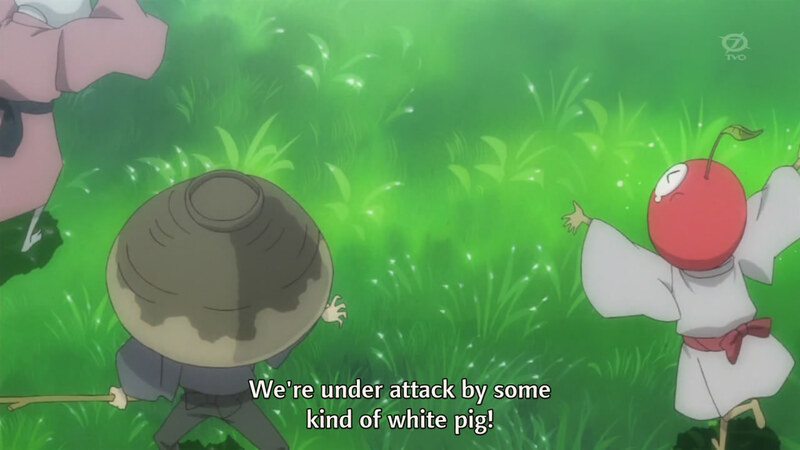 I need to go find a pig. I had no idea they were hairy like cats. Despite having bad memories resurface, Natsume attempted to sort out the matter himself, not wanting Murasaki to eat Shibata. Nyanko-sensei transformed for a brief second, and even then it was only a cautionary gesture, as Murasaki was the spirit of a tree that had fallen, and was on the verge of death. After realizing that Murasaki herself was also in love with Shibata, Natsume ran to get him (and he was pretty close by, luckily). The two had a sweet farewell as Murasaki disappeared into the air, ending her lifespan. By the end of the episode, the "friendship", or whatever it is, seemed to have been mended, as the two were able to act as old friends with one another. Natsume's quiet monologue was quite thoughtful; it seems that he's avoided Reiko's predicament by being able to open his heart to humans and spirits alike. Ep04 was once again about Natsume's childhood, having nothing to do with the Book of Friends, and presented an event that occurred in the past through the eyes of a spirit. With midterm exams over, Natsume and the three classmates from the previous episode made plans to go to an art gallery exhibition. When Touko (his female guardian) was reminiscing about her childhood memories, and one particular event, Natsume got to thinking about his childhood, and how he didn't have any happy memories. When the scene shifted to a spirit sitting in a tree, I assumed that the episode would be about Natsume being hunted down for his Book of Friends, but ended up being pretty wrong. 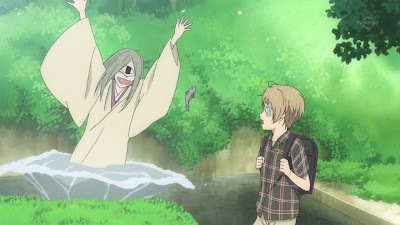 I actually didn't know that a flashback had occurred until a child-sized Natsume was introduced; I genuinely thought the person the spirit had been referring to was Reiko. Either way, the spirit thought about how she had met Natsume a long, long time ago, and he had been the only person that could see her. 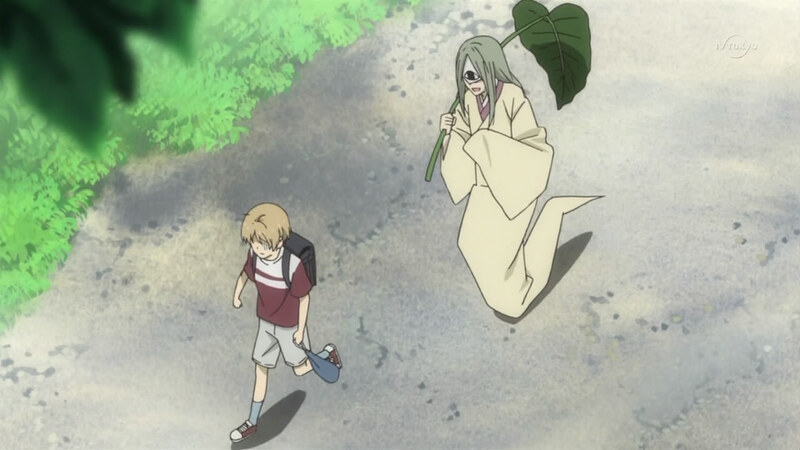 Not understanding her own loneliness and writing it off as wanting to play around with the kid for being so rude to her, she sought him out everyday while Natsume, initially thinking that perhaps the spirit cared about him, was extremely hurt by her ill-advised defensive reaction of denying it. This continued until Natsume just snapped one day (understandably; the surprise of seeing her made him fall onto a boy that had been talking to him normally), with that event being the last that they really saw each other. Despite how long had passed, the spirit still remembered that event and, slightly subconsciously, yearned to see Natsume once more, despite being angry with humans in general. Were his next set of guardians demons or something? On the other hand, the flashback also provided some more insight into Natsume's childhood. 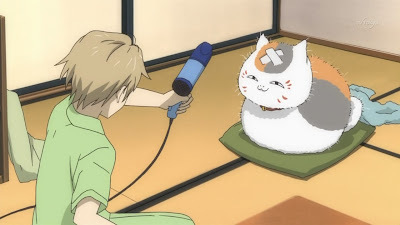 The current relative that he was staying with didn't try to hide that he wasn't wanted, and even then Natsume was happy with little things (such as receiving a coat, kind of as a "bribe" so that his relative wouldn't feel guilty). It was heart-wrenching to see these scenes, and understandable why he had grown up with such unhappy memories. What was tongue-in-cheek was that, for some reason, Natsume was able to change whereas Reiko wasn't. Was it meeting Nyanko-sensei? Was it finding true kindness with Touko and Shigeru? Either way, when Natsume thought back to his childhood - and the spirit of this episode, particularly - he was able to realize what the spirit had truly felt, and came back to visit after his outing with his friends. The episode ended with him reciting the (strange) concept that if you had someone you longed to see, you weren't alone. 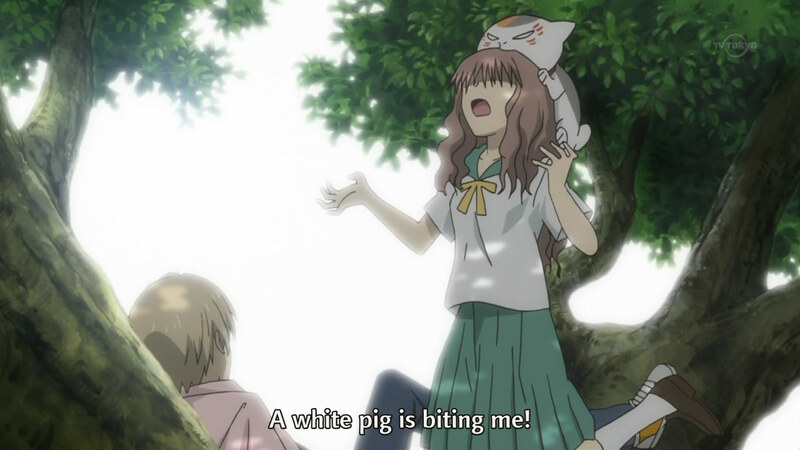 It would be a clincher if Natsume fell for a spirit. This anime really knows how to present ideas and scenes in a way that gets to my emotions. In print, I'm sure these events seem pretty cliche and overdone. However, if you're able to stand the pace of the episodes, it's all pretty realistic (given that you first assume that spirits, demons, and etc are real). This is the kind of anime that I don't desperately grab each week to watch - but, when I do begin watching an episode, it always leaves me wanting more of it.